Although we do not consciously feel our liver working, it actually performs many important functions that are necessary for the maintenance of homeostasis. From blood storage to vitamin synthesis, the liver does so many things that in times of dysfunction, such as in drug-induced liver damage, the consequences immediately become apparent. Weighing around a kilogram and a half in normal human adults, the liver makes up around 2 percent of the total body weight. It is considered as the largest internal organ. It is supplied by 2 different systems: one coming from the portal vein which carries nutrient-rich blood from the gut, and the other from the hepatic artery which carries oxygenated blood from the aorta and the heart. These vessels enter the liver through the porta hepatis or the hilum. It branches into the liver tissues to numerous vessels. The entirety of the liver is made up of the functional hepatic unit called the liver lobule. This unit is usually represented as a collection of hepatocytes that are arranged in a hexagon, with a triad made up of tributaries from the portal vein, hepatic artery, and bile duct surrounding the peripheries. Blood that passes through the whole unit is drained through the central vein located at the center of the lobule. 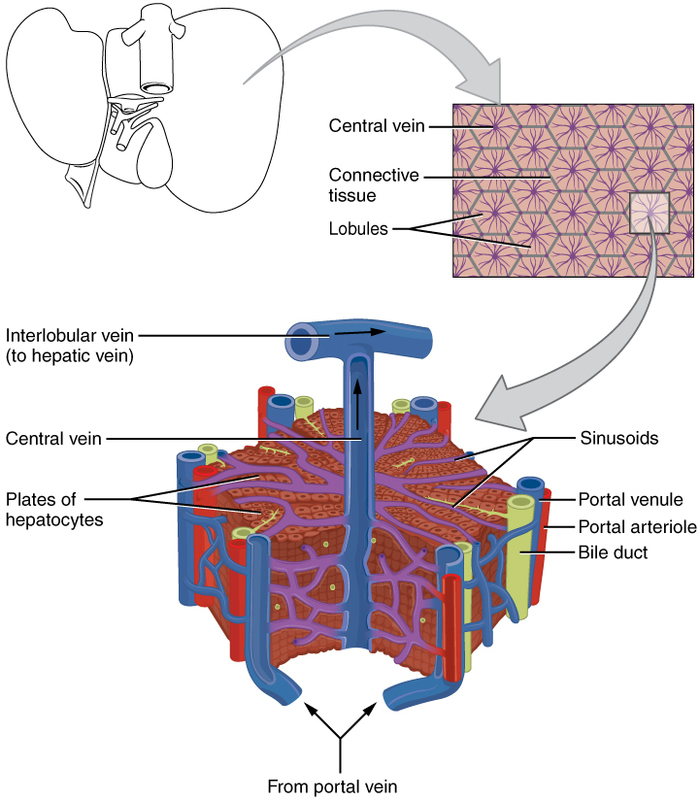 Aside from the hepatic cells, the lobule is also made up of venous sinusoids that are lined with endothelial cells, in between of which are large pores, and Kupffer cells. The pores in the sinusoids allow blood to pass through the venule and into the parenchyma easily. The latter type of cell is capable of phagocytosing bacteria and other pathogens that could come in contact with the sinusoids and in the liver parenchyma. The liver performs so many functions, which is why any disruptions in the integrity of the liver parenchyma result in drastic homeostatic changes which could only result to morbid or even fatal results if not controlled. An understanding of some of the features of the liver could shed light on how drugs bring about the signs and symptoms that are present in toxicities. The blood vessels in the normal adult liver can hold around 450 mL of blood during ordinary circumstances. However, because of its distensibility, it can hold up to 0.5 to 1 liter of blood in the presence of pathological conditions such as congestive heart failure or peripheral congestion. Because of this capability, the liver can store blood to normalize the pressure in the circulatory system and provide blood supply in situations where there is diminished blood supply. During partial liver resection, around 70 percent of the whole liver is removed. After this surgical procedure, the liver is able to regenerate a new set of hepatocytes and of course, regrow the lost portion of the organ. This amazing feature of the liver is thought to be a product of hepatocyte growth factor (HGF), epidermal growth factor, tumor necrosis factor (TNF) and interleukin 6 (IL-6). Although able to regenerate, the growth is limited to a certain extent with the help of transforming growth factor β (TGF-β)>. A large amount of blood normally flows through the sinusoids and into the liver parenchyma, which makes the liver very much prone to blood-borne infection and damage by pathogens and other substances. However, this is offset by the presence of the active phagocytosing Kupffer cells which constantly keeps pathogens from invading the liver tissue. The liver is the primary organ involved in the metabolism of carbohydrates, fats, and proteins. As for carbohydrates, the liver is responsible for the storage of glycogen and the formation of glucose units from other sources such as lipid and protein metabolites and other sugars. The liver is also responsible for the oxidation of fats and the synthesis of cholesterol and other lipids. For proteins, the organ is involved in the deamination and synthesis of amino acids. The liver is very well known as a storage site for a lot of vitamins. The most dominant vitamins present in some of the hepatocytes in the liver are vitamin A, vitamin D and vitamin B12. With this feature, eating a diet that is low in the said vitamins for a few days does not necessarily lead to deficiencies. The liver is also an efficient storage site for iron. There are many clotting factors that are produced in the liver. In the presence of vitamin K, the liver is able to synthesize fibrinogen, prothrombin, accelerator globulin, and factors VII, IX, and X. Generally speaking, drugs are not the same when they are excreted out from the body (except for some). A lot of processes actually occur in between absorption and excretion, and this is mainly because of the metabolic features of the liver. In a phenomenon called the first-pass effect, medications and other substances that are absorbed in the gut are first transferred to the liver by the portal circulation. This makes the liver the screening area for the substances that enter the body through the digestive system. Phase I: Drugs are converted into more polar forms by adding functional groups. 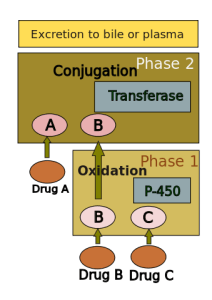 Phase II: Drugs that fail to become excreted after phase I are conjugated into more polar forms. Without this function, toxic levels of the medications would remain in the bloodstream. Phase I reactions usually involve the microsomal protein CYP450 as well as other microsomal enzyme systems. 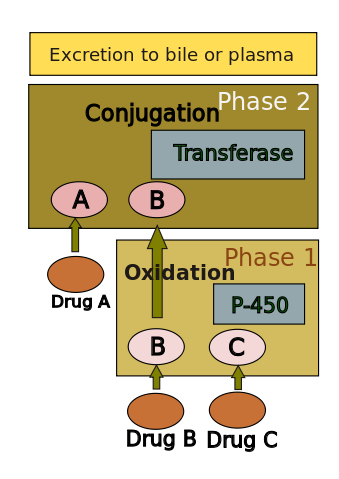 Phase II usually involves conjugation reactions that are catalyzed by transferases. 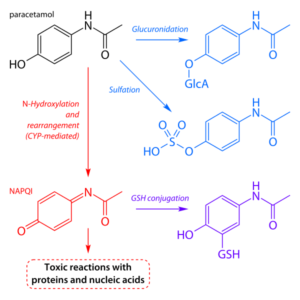 Substrates for these conjugation reactions usually include the endogenous substances glucuronic acid, sulfuric acid, acetic acid and some amino acids. As mentioned previously. The liver serves as a passageway of almost all the substances that are absorbed from the gut into the circulation. Although processes that happen in the liver in this sense involve the biotransformation of medications and other substances into usable and disposable forms by the organ, this may not be always the case. Certain medications and harmful substances are actually converted into active toxins once they pass through the liver. An example of which is a drug that is absorbed by the gut as a hapten which could bind to proteins in the liver to cause immunogen production. These newly formed substances can cause hypersensitivity reaction that could ultimately damage many organs and systems, including the liver itself. This is only one of the many mechanisms by which certain medications damage the liver. Unusual drug reactions leading to acute liver failure commonly develop upon the first exposure to the substance. One can actually draw a diagnosis based from the temporal; relationship between the manifestations and the exposure to the medication. All over the globe, liver damage caused by drugs are said to happen in 1—14 out of 100,000 individuals. The results from this vary from cases of acute liver failure to more chronic ones. The usually implicated substances for drug-induced liver toxicities include alcohol, herbal medications, dietary supplements, topical medications, toxic chemicals such as fertilizers and pesticides, and of course, over the counter medications such as acetaminophen. Drug reactions can be characterized as eitherpredictable or idiosyncratic. Predictable drug reactions such as that with acetaminophen are dose-dependent and can mean positive implications in the ease of management. Idiosyncratic reactions usually involve a mixture of cell-damaging processes such as hypersensitivity reactions and direct cytotoxicity. The most commonly affected structures aside from the liver when these reactions happen are the bile ducts. Examples of medications that can trigger these are chlorpromazine and halothane. Among the drugs that produce predictable toxic reactions with the liver is acetaminophen. It is considered as the most common cause of acute liver failure with indications of liver transplantation in the United States. Being readily available as an over-the-counter drug, acetaminophen is frequently used inappropriately. Acetaminophen is commonly used for the treatment of fever and mild pain. It is available in many preparations including tablets, suspensions, syrups, suppositories and intravenous solutions. When taken with a therapeutic dose, most of the acetaminophen is metabolized via conjugation by phase II enzymes in the liver. In the urine, you may find the metabolites of this drug bound to glucuronates and sulfates. 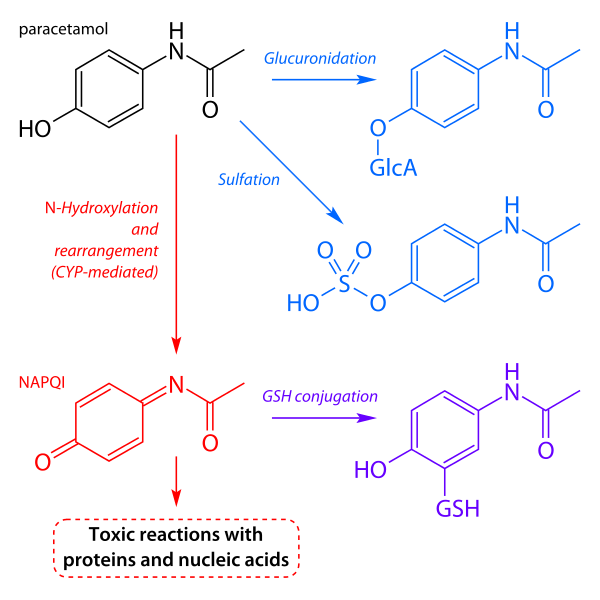 However, a small amount of the dose actually escape the phase II conjugation and enter other metabolic reactions that are mediated by CYP proteins. This results in the conversion of otherwise harmless acetaminophen metabolites into N-acetyl-p-benzoquinoneimine or NAPQI. Individuals who take acetaminophen in proper amounts may be spared from the harmful effects of NAPQI metabolites because these reactive substances can be actually neutralized by conjugation with glutathione. After all, only about 5 % of the total dose enter this type of reaction which could only mean that only traces of NAPQI exist with therapeutic doses. A particularly narrow therapeutic window for acetaminophen occurs with alcoholics because alcohol is known to induce the pathways that lead to the conversion of acetaminophen metabolites to NAPQI. This means that alcoholics should be monitored closely when taking this seemingly harmless over-the-counter drug. Initially, efforts to keep the drug from being absorbed in the intestines are instituted. Measures such as induced vomiting, gastric lavage and administration of activated charcoal or cholestyramine are initiated. Other supportive measures are started as well. It is important to flush out any remaining acetaminophen in the stomach by implementing the first two management techniques before administering other medications. However, the time from ingestion should be noted upon admission because some treatments such as the administration of charcoal and cholestyramine become inefficient after 30 minutes from acetaminophen overdosage.